Previously the Worg Pup changed colors when you summoned it. It had a black and brown skin. 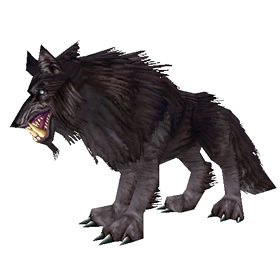 However, post Patch 5.1 the Worg Pup lost its color-changing ability, and it's unknown if the alternate color will return. Prior to patch 4.0.3, this pet could be obtained from the quest Kibler's Exotic Pets. Instantly deals 295 Beast damage and increases your speed by 100% for 1 round. Handsome enough a critter, but not very pup-like. Is he supposed to be a yearling? That's nearly a teenager in canine lifespan. The Healthiest Wolf you can get, 1725 health. With Dazzling Dance, to get 325 speed, and Crouch it will take your opponent a long time to get down that high health. Flurry eats up undead and with Crouch you can easily take both CoD and Haunt for example. If dancing your Flurry will also eat through Decoys with ease. Quite strong and underused pet family, Wolves. They're fixing him!! 5.2 notes: Pets whose color schemes change each time they are summoned have returned. Older pets with this behavior now have it back, as well as some newcomers. I used to summon this until it turned brown, since it can be both brown and black, and I prefer the brown. But after 5.1 I have summoned it 40+ times and it is black every time. Am I just really unlucky or did they change it, when they repaired the colourchanging pets, one had won in battles? Hoping someone else could check something. I just bought, to my surprise, both the Worg Pup and Smolderweb Hatchling from Karin <Stable Master> in Stormwind. I may not have looked properly but neither appeared to be of limited supply - but I bought both, learned them on my alt and checked the vendor again to find only a Rope Leash for sale. Anyone else encountered this? Since the quests are gone, now you get the worg pup as a drop from killing Quartermaster Zigris, just as you get the smolderweb hatchling from killing Mother Smolderweb. Got this little guy today, Along with the Smolderweb Hatchling. Solo'd the instance on my lvl 74 hunter pretty easily. Both pets dropped on the first run and I'm planning on going through it again to help a friend get it, hopefully the 100% drop rate is correct. Was sooo happy when I got these two, especially the pup since it completed my wolf family. I now have the wolf mounts, a wolf pet (called Spire since I tamed him in that very instance) and the pup. Just picked up a spider while doing it. Just head to Black Rock mountain, take the entrance with the orcs (half way up), and head down as low as you can killing everything in your path. Eventually you will hit the horde village and kill the quartermaster for the pup. The new drop system for this pet and the Smolderweb Hatchling definitely makes it easier for my Bloodsail Admiral character to obtain these pets. I was considering grinding my warlock's character reputation via silk just to complete her collection since I made the mistake of getting that feat of strength first without completing the quests for the pets. Now I don't have to worry about that - thanks Blizz! Same as the Smolderweb Hatchling, since patch 4.0.6 this is now a drop from Lower Blackrock Spire, this one from Quartermaster Zigris. I believe the drop rate is 100%. It does drop from Zigris on the PTR. Despite still having a silver dragon, Zigris seems to be there every ID, and always drops the carrier. someone on ptr and can confirm this? Kibler doesn't offer the quest anymore. WoWhead says "Kibler's Exotic Pets" is no longer in the game. Any idea if one can still get this or the (also dead) En-Ay-Es-Tee-Why pet some other way? I love this little guy. Granted, he may be just a scaled version of a regular worg, but as a Hunter, he looks like the puppy version of my tamed Sentry Worg. Started collecting pets after you did these quests and discarded the pet boxes for lack of space (you heartless person, You)? Fear not! Just go to any stablemaster and talk to them, and they will give you back your pet reward! This pet is one of my old-world favorites, because it's the only dog-like pet. Although we may end up getting dogs in Cataclysm, this is the O.G. canine! The Worg Pup and Smolderweb Hatchling are both done through quests given from the Kibler. They can be done solo quite easily at lvl 60 and probably earlier. Simply use the shortcut in LBRS to skip half of the instance (it's to your right when you face the first bridge. Simply jump off the ledge and onto the narrow platform). Invisibility Pots or similar are recommended. Worgs are the favored companions of orcs and are fiercely loyal on the battlefield.